Amy Porter first leapt to international attention when she won the Kobe International Flute Competition in Japan, which led to invitations to perform throughout the world. She has been acclaimed by major critics as an exciting and inspiring American artist who matches her fine controlled playing to a commanding, sensual stage presence. Ms. Porter has been a featured soloist with the American Composers Orchestra at Carnegie Hall’s Zankel Hall, and with the Atlanta, Houston, Omaha, Delaware, Albany, Flint, Billings, Battle Creek, Arkansas, and Elgin symphony orchestras. She has twice appeared in recital at the National Concert Hall in Taipei, as well as at Skidmore College’s Arthur Zankel Music Center. Her collaborators have included such distinguished conductors as Nicholas McGegan, Ransom Wilson, David Alan Miller, Yoel Levi, Thomas Wilkins, José-Luis Gomez, Enrique Diemecke, David Amado, Anne Harrigan, and Arie Lipsky. She has given premieres of works by Michael Daugherty, Ellen Taaffe Zwilich, Joel Puckett, Christopher Caliendo, Katherine Hoover, and Frank Ticheli, among others. 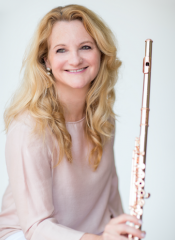 Winner of the 3rd Kobe International Flute Competition and the Paris/Ville d’Avray International Flute Competition, Ms. Porter has served on international juries around the world, including the 6th Kobe International Flute Competition. She has been heard in recital on National Public Radio; highlighted on PBS’s Live From Lincoln Center; and featured on the covers and as a writer for the magazines Flute Talk in the USA and The Flute in Japan. Formerly a member of the Atlanta Symphony Orchestra, Ms. Porter was recently appointed Principal Flute of North Carolina’s Brevard Music Center, where she will perform as soloist, chamber musician, and orchestral player. Highlights of Ms. Porter’s 2019-20 season include a tour of Missouri with Trio Virado and appearances at the Brevard Music Center as Principal Flute, The University of Kansas, and MidSouth Flute Festival. She will also perform Daugherty's "Trail of Tears" with the Indianapolis Chamber Orchestra. Recent study guide releases include her latest “THE GAUBERT CYCLE: The Complete Works for Flute and Piano by Philippe Gaubert” with guests Tim Carey and Penelope Fischer. The printed edition, Philippe Gaubert Treasures for Flute and Piano, is published by Carl Fischer. Born in Wilmington, Delaware, Ms. Porter graduated from The Juilliard School and pursued further studies at the Mozarteum Academy in Salzburg. She plays a 14K white gold flute with rose gold engraved keys made for her by the Wm. S. Haynes Co.